sharing our expertise with our clients. Crooked Oak has quickly become one of Chicago’s most reliable custom storage companies. 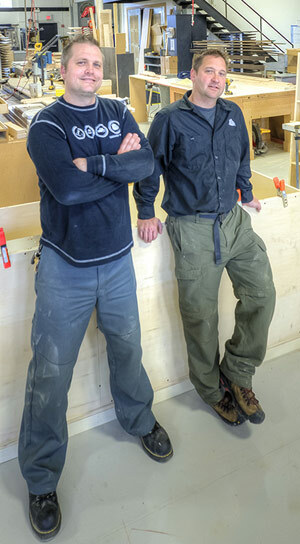 Crooked Oak Founders & Owners Joel Schellhase and Joe Daschbach. Our success is due in large part to the principles upon which Crooked Oak was founded: Allow customers creative license. Create something beautiful and functional. Accept nothing but 100% customer satisfaction. In October 2004, long-time friends Joe Daschbach and Joel Schellhase set out to start a business that would produce high-end custom closet designs and handmade cabinetry. Joe was a cabinetmaker by trade and had a vision for a company that took pride in its artistic creations. Joel was a former music producer with a keen ability to connect with people. Passionate about creating a company that truly put its customers first, Joe and Joel turned down the opportunity to run a closet franchise and, instead, decided to create something completely fresh and modern. Thus, Crooked Oak was born. Our design center and production facility, located in the near western suburbs of Chicago, is open to the public and allows us to provide service throughout the Chicagoland area. Our high-quality work ranges from Murphy beds and cabinets to entertainment centers, home offices and more. In addition we offer complimentary in-home estimates. If you have questions, or would like an estimate, please contact us at 708.344.6955 or email info@crookedoak.com. Crooked Oak, creator of custom closet design and handmade cabinetry, strives to provide our customers with the finest craftsmanship, materials and service. Our clients can expect nothing but the best in design, quality and customer service.